The Chiefs offense was boring, but effective. Doug Pederson's (or Andy's Reid's or whomever's) Chiefs offense was far better than Chip Kelly's Eagles offense in 2015. And really, it wasn't even close. 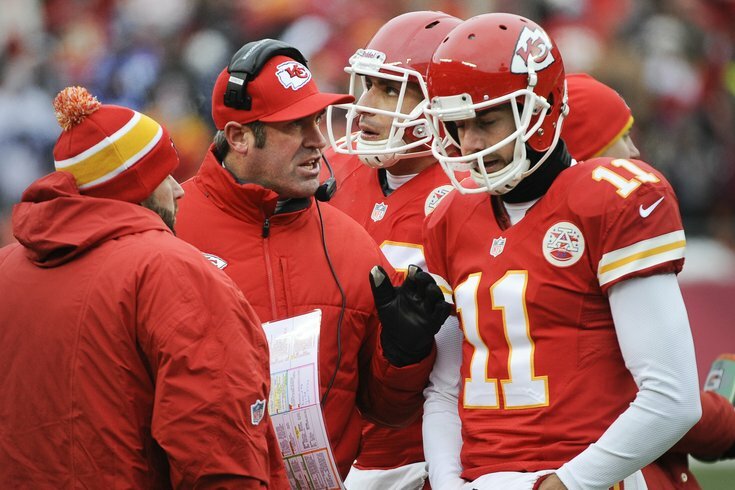 In 2013, the Kansas City Chiefs had the 21st ranked offense in the NFL in terms of total yards. In 2014, it was ranked 25th. In 2015, it was ranked 27th. In other words, the Chiefs have been a borderline bottom dozen offense for the entirety of Doug Pederson's tenure with the Chiefs. Before we start storming the NovaCare Complex with pitchforks and torches for hiring a guy who oversaw an offense that put up the numbers above, know that they are entirely meaningless without context. Since around the second half of Chip Kelly's tenure in Philadelphia, we've attempted (sometimes futilely) to explain that "per game" stats were meaningless as a comparative measure between Kelly's fast-pace offense and other more traditional offenses around the NFL. The Eagles typically ran more drives per game, and, as a result, faced more drives than any other team in the NFL. That artificially inflated both the offense's and defense's numbers. In other words, it made Kelly's offense look better than it was, and the defense worse than it was. The traditional stats say that the Eagles were 12th in yards per game and 13th in points per game. Without context, those numbers would indicate the Eagles' offense was better than average, when they were most definitely very bad. Here is where the Eagles ranked on a "per drive" basis, which evens the playing field for comparative purposes. A good comparison of Kelly's inflated stats is actually the 2013-2014 Philadelphia 76ers. In Year 1 of "The Tank," the Sixers averaged the 19th most points per game in the NBA. However, because they played at a faster pace than any team in the league, that point output was entirely misleading. It showed slightly-below-average production, when anyone who watched them play could easily identify that they were an absolute mess. Offensively, they turned the ball over more than any team in the league, and defensively, because they faced so many possessions, they gave up the most points in the NBA. The style with which the Eagles played in 2015 really wasn't all that much different. In 2015, the Chiefs' offense was kind of the opposite. The Eagles wrongly played as if the strength of the team was the offense, while the Chiefs' staff made the obvious observation that their players on defense were better than their players on offense, and game-planned accordingly. The Chiefs relied on a deceptive rushing attack, a conservative passing game, and not turning the ball over. Boring? Probably. Effective? Yep. According to FootballOutsiders.com's DVOA rankings, the Chiefs had the sixth ranked offense in the NFL. The Eagles? 26th. And they were missing their best player. To note, this is not to say that Pederson is the right choice. That is to be determined. However, the most simple way it can be put is that in 2015, the Eagles had possessions in quantity, while the Chiefs were more interested in quality.